There are two free tickets to the Southeast Botanical Gardens to be given away. The adult’s one normally costs ¥1500 at the gate or ¥1300 in advance, while the child’s costs ¥900 at the gate and ¥800 in advance. Read More! Club Rhapsody will be holding its one year anniversary party this Saturday, 6th May. The classy club, which aims to provide quality entertainment to the over 30 crowd, opens its doors at 9 pm. Read More! The King is dead! Long live the King! “There have been lots of sightings of me around the world” says Okinawa’s Elvis “but I’ve been here for years. I do ten or 12 gigs a month. Read More! Every year, Naha holds one of the most exciting and memorable events in Okinawa. 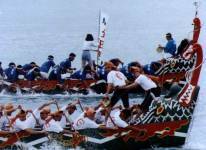 Even though Naha is a modern industrialized city, the concrete and steel are swept away during the dragon boat races. Read More! The Okinawan people have had a long love affair with goats, and the attraction continues. Okinawa City has held a goat festival five years running, and last year a Japan goat summit was held, attracting many farmers and researchers from around Japan. Read More! To the Japanese, the perfect petal blossoms of the cherry tree, "sakura", are truly sacred. 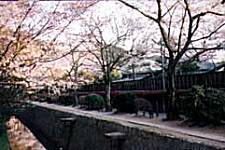 As the national flower of Japan, it is said that the cherry blossom symbolizes the character of the people as well as their love of all things natural. Read More! Gaylene Levesque, a teacher at the University of Ryukyus, is an ordinary English teacher with an extraordinary teaching experience. When she first set foot in the teaching field decades ago, she had never thought that her job would lead her to a brief but challenging task in a former communist republic that just declared independence from the Soviet Union, when the communist empire collapsed in December 1991. Read More! Over 1600 volunteers: men, women, children, students and senior citizens from every race, creed, color and religion, every profession from business people to teachers, amateur athletes and coaches dedicated their time to the Special Olympics Event two weeks ago. They were part of the 500,000 volunteers world-wide who work year-round with the Special Olympics athletes and teams, coaching, fund raising, scoring and cheering on the athletes, as they try harder, run a bit farther and aim to do their best. Read More!